25+ Clean and Simple WordPress Themes – Less is More! With a simple WordPress theme you often get a good start on a web design project. A simple start often makes a better platform for adding a personal touch. 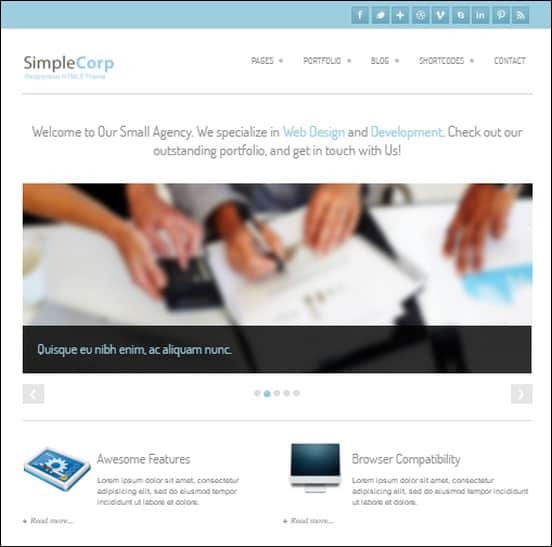 I am sure you noticed that simplicity is a strong trend right now in web design. This is why simple WordPress themes tend to be very popular – they are good for usability and typically good as a starting point for creating an individual online look and feel. Lucky for you there are many high quality cool minimalistic WordPress themes available to pick from. This is why we keep updating this resource with new themes quite often. Website and blog designs certainly can be complex, colorful and overwhelming and many themes for WordPress belong to that category. Some web-masters and bloggers on the other hand prefer simple and clean layouts for their sites leaving more space for the text itself to be in focus. Minimalistic designs generally help visitors find what they are looking for easier and compared to heavy loaded web designs, they are often more inviting and easy to navigate. If you are looking for simple WordPress themes that help your design comply with basic elements of minimalistic design you have come to the right place! I am sure the list of WordPress simple themes below will be a real time saver and a source of good inspiration. You will find both premium and free minimalistic and simple WordPress themes organized into two sections. This makes it easy for you to find the type of theme you are looking for. One of the hot and current trends in web design right now is themes with responsive design and WordPress layout builders. The WordPress community have picked this up, there are many interesting responsive themes for WordPress available now, and they are worth considering making sure your site looks great on all platforms including mobile devices. Many of the themes in this article are responsive, but check the preview to test how each theme looks in mobile browsers. Just resize your browser if it is easier for you to test on a PC or MAC. I recently updated this resource with more simple WordPress themes and all links have been checked. The simple WordPress websites below below are good for many purposes as they are clean and have good space for content. Remember that most premium themes are supported, documented and typically well coded by the theme vendors and they are often updated quickly when WordPress is taking large steps in its development. There are many options and finding the right premium theme for your WordPress site can be a challenge. I hope this post will help you out. TRIM is one of the cool responsive themes with a simple design one need to check out. 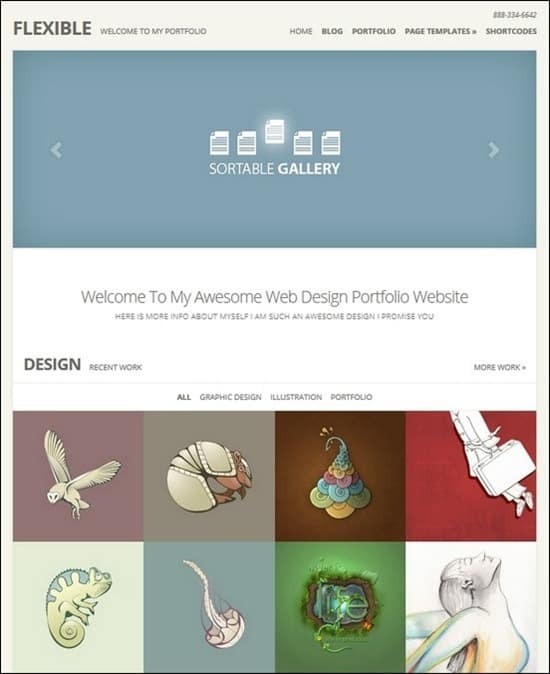 It is optimal for a business portfolio website. With the page builder from the theme vendor it is possible to set up nearly any type of web page without coding at all. The theme comes with a mobile friendly design and adapt to the visitors screen size. 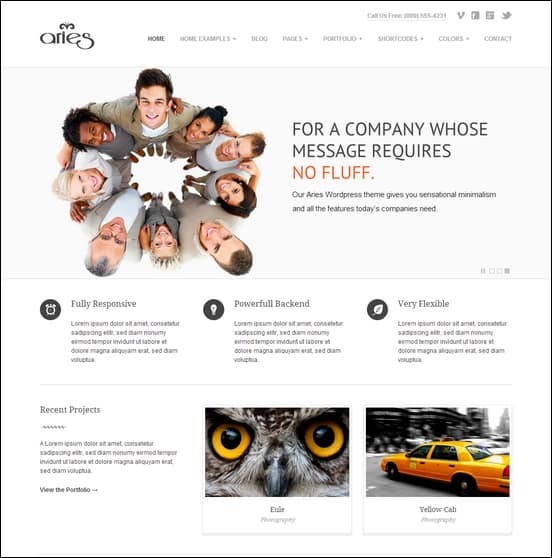 Trim is a WordPress template and it is simple, professional, versatile and fast. at first sight Trim might look simple, but with this also get a good balance and a user friendly layout. The theme have many build in features and it is a great theme that will prove useful for a variety of different websites. Trim is a fully mobile friendly with a responsive design that adapts to your user’s variable screen size. System is called a multi-purpose theme and for a reason. 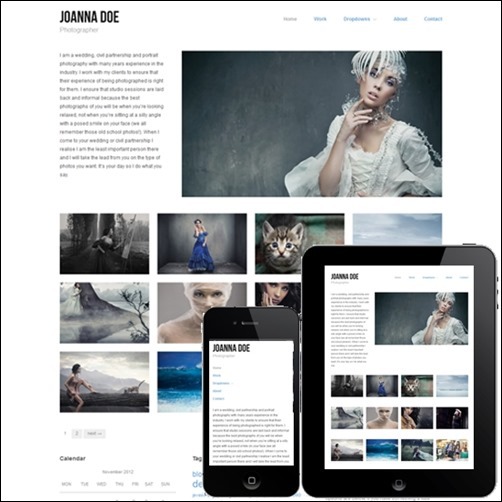 It includes overall layouts for business, portfolio and creative one page websites. Further, you will find a page builder with drag and drop that will help you build your own page layouts without coding. System also have the Revelution slider in the package and much more. Flexible is a simplistic and cool looking portfolio theme for WordPress. With ElegantThemes page builder this theme turns into a powerful web design framework. the style is flat and minimalistic but with great use of colors to keep users happy. While perfect for online portfolios I also think the blog layout makes Flexible useful as a simple blog theme. 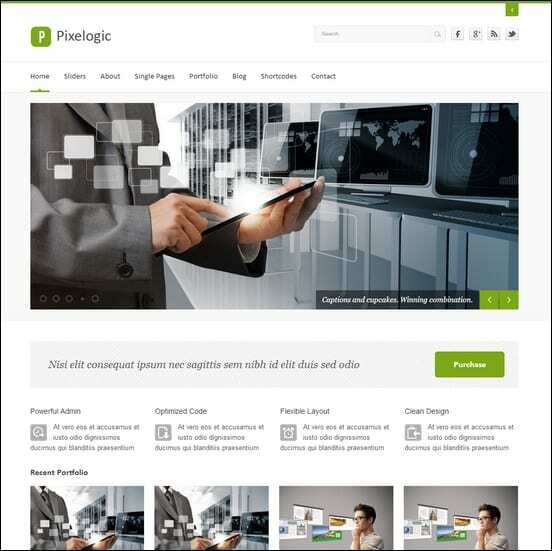 With Pixelogic you get a WordPress theme with a simple and minimal design however it is far from simple when it comes to layout options and features. The theme comes with 7 home page layouts, 7 blog variations, a page builder, various post types, flexslider and much more. 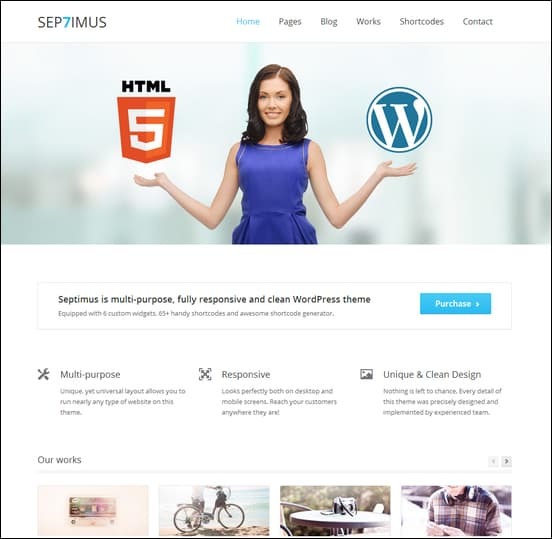 Septimus is a business style theme with a clean and minimal design. 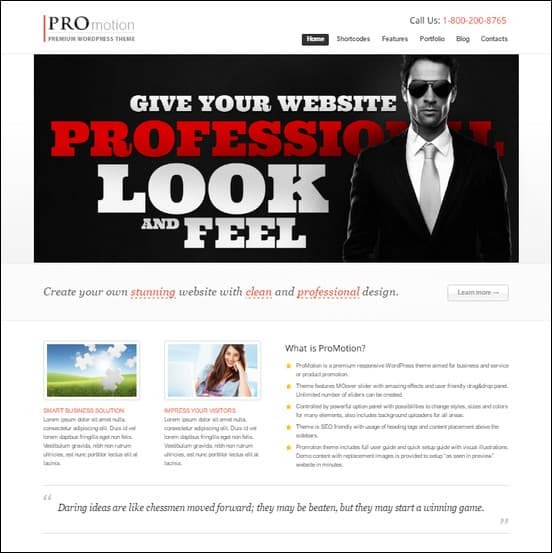 The theme is built with Bootstrap and offers a great responsive layout. There are more than 65 shortcodes included, a shortcode generator, custom widgets, custom post types and more. 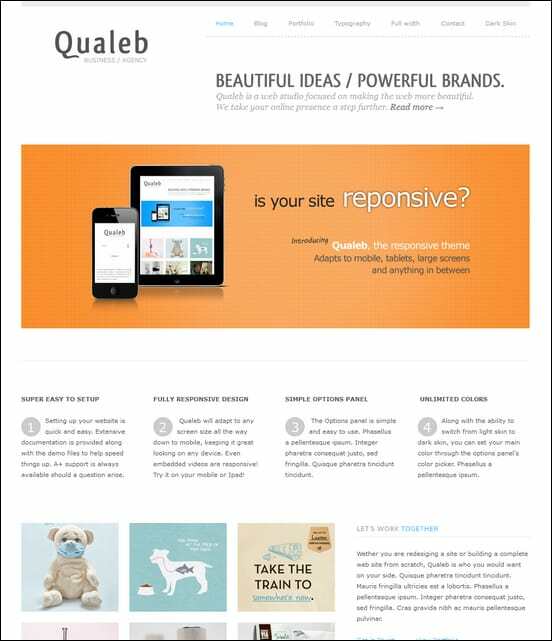 With Qualeb you have two color schemes – Dark and Light. The theme is responsive and well prepared for mobile visitors. 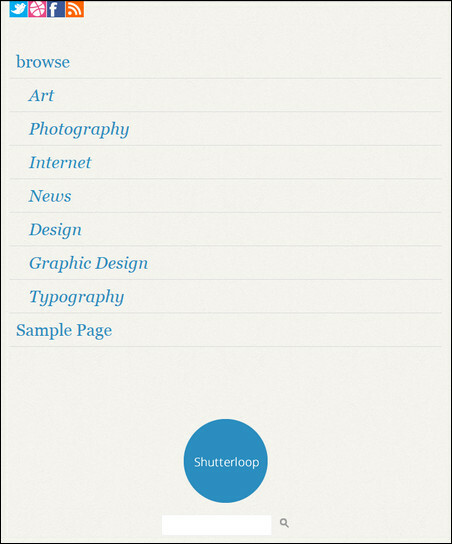 The slider is also responsive and adapt to small screens. You get plenty of page building blocks in the custom widgets, custom post types and shortcodes included in this theme. 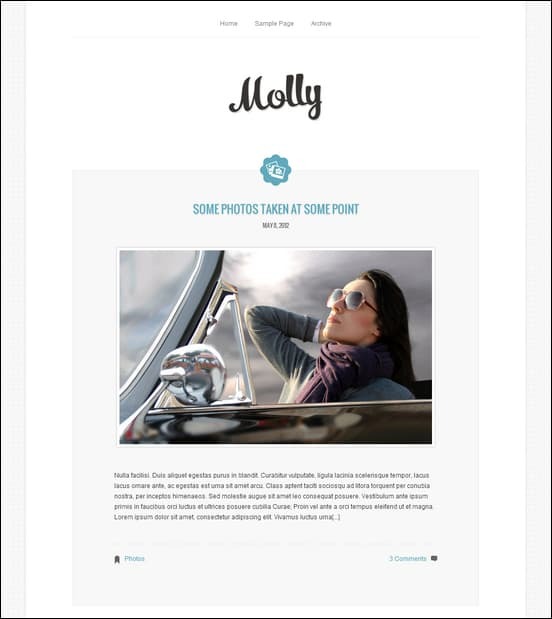 Molly is a clean and minimal blogging theme for WordPress with a responsive layout. The theme have an audio player built in, support for galleries and video embedding. 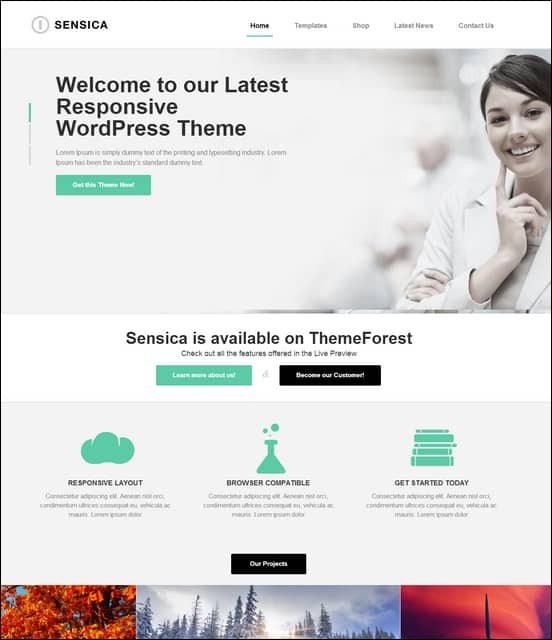 Sensica is a corporate WordPress theme with support for WooCommerce. The design of this theme is simple and clean and it may also be used for a portfolio website. 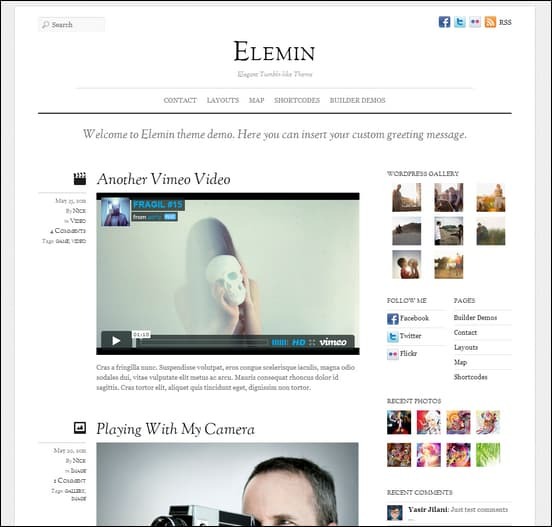 Elemin is a blogging theme with a simple design and great responsive layout. The theme includes several custom post formats that are well integrated into the design of the pages. There are 11 skins included, wigetized footer and more fueatures as well. 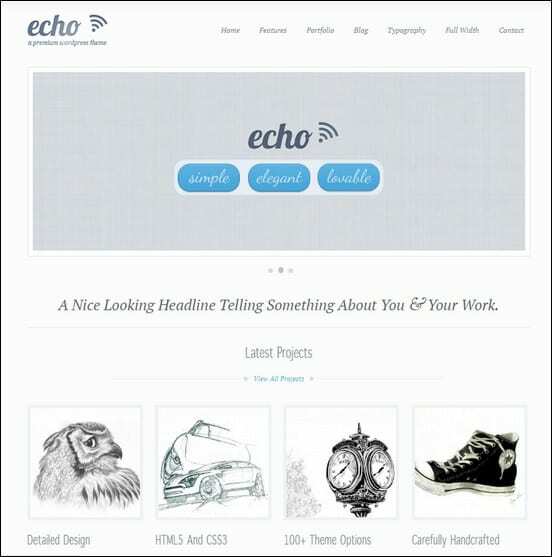 Echo is a clean and simple WordPress Theme, but a very powerful and a highly customizable portfolio theme, aimed at anyone who needs a showcase. If you’re looking for a gorgeous portfolio theme, then you’ve just found it.Echo comes with an excellent customer support and a bulletproof documentation file that discusses every aspect of the theme in details, ensuring you don’t face any difficulties in setting up the theme and maintaining it. This is one of the Simple WordPress themes you should check out! 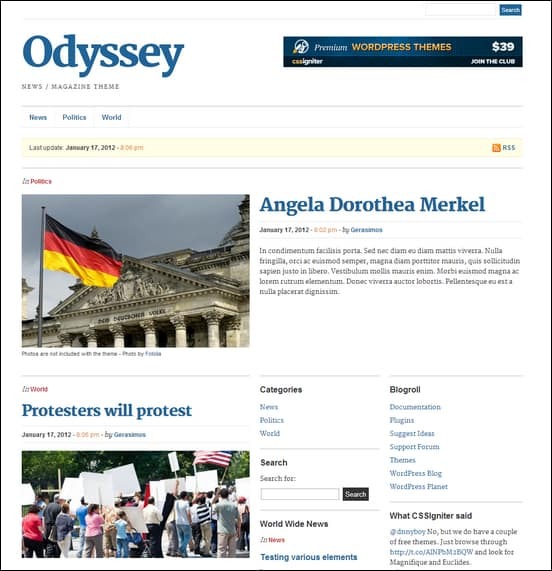 Odyssey is a minimalistic and simple WordPress theme for building a magazine style website. The theme support a double sidebar layout that is often used in online magazines. With Odyssey you get a few custom widgets, multiple layouts and more. 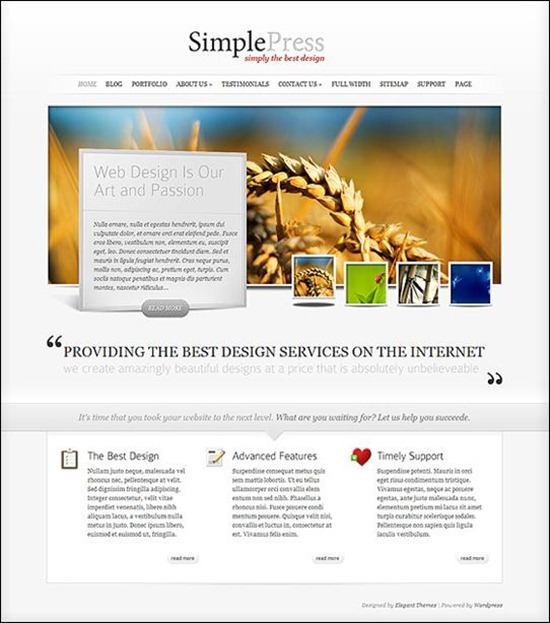 It is possible to find great free WordPress themes with a simple design and layout. Some are even responsive and have cool otpions pages to set up the theme. Having said that, it is likely that free themes are not supported now and less likely when planning long term. 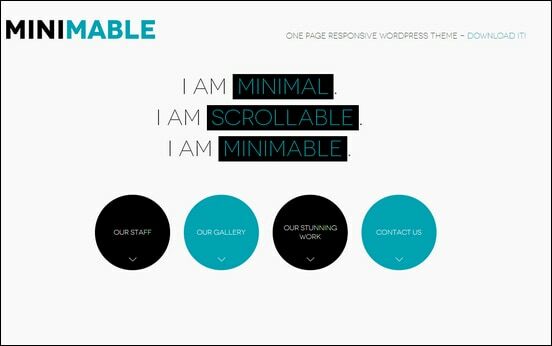 Minimable is a cool simple one page WordPress theme with an exceptional parallax scrolling effect. The theme is based on Bootstrap and comes with cool features such as page templates, adjustable colors, portfolio function and more. 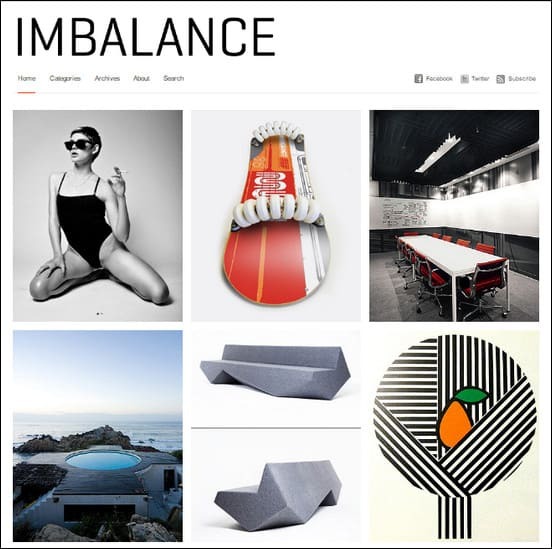 Imbalance is a cool free choice for building an online magazine, a blog or your personal portfolio website. This simple WordPress theme is designed with a contemporary modern vibe in a minimalistic style. If you choose the Imbalance theme, you can easily fresh-up your project whether it is a blog or i-magazine. 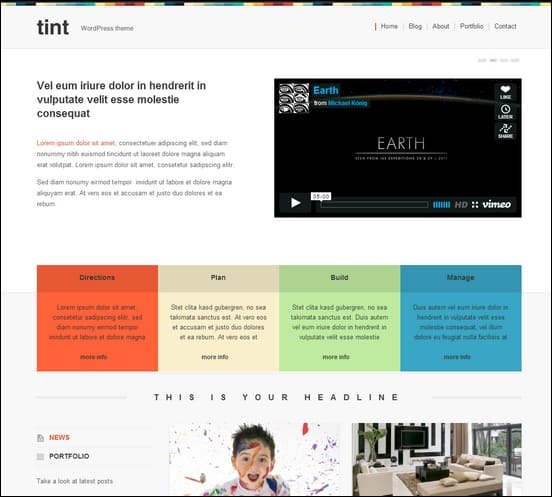 With Tint you get a free portfolio theme with a minimal and simple look and feel. The theme use colors to spice up the design and the interactive slider at the top is great for featuring content, videos and images. You will find custom widgets, shortcode generator, page templates that you can use to set up your own pages. 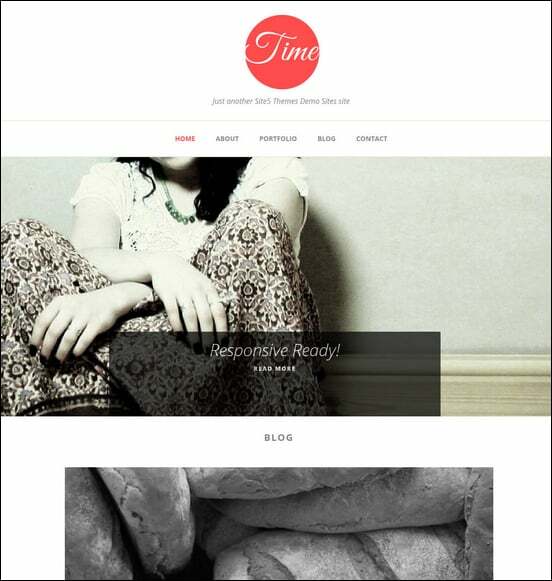 Time is a clean responsive theme for personal blogs. It comes with an advanced options manager, portfolio and slider functions. ShutterLoop is a fully responsive free photography wordpress theme. The theme has great feature control through with custom control panel. Responsive Pro adds exciting new customization features to WordPress including the Theme Customizer which lets you visually change the appearance of the theme live with 12 colorful skins to select from, typography options with Google Fonts, and other powerful customization tools. 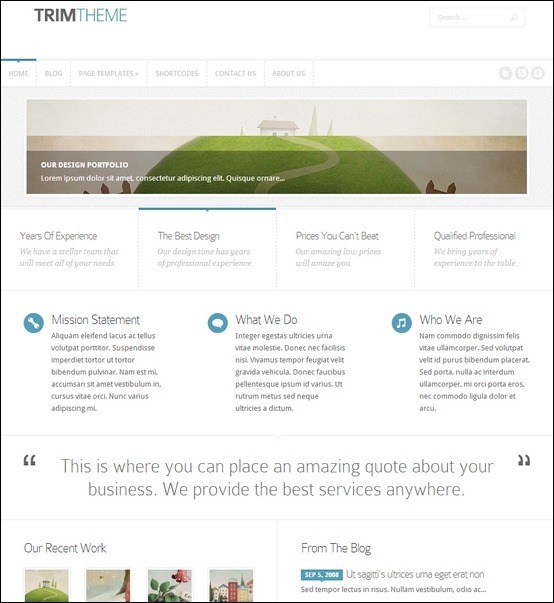 A simple corporate theme for wordpress. It is super responsive that it adapts up to mobile devices. Base is a simple responsive wordpress theme that is easy to customize. It has a lot of customization options that will suite your very needs. It also has animated back to top button, Custom header and footer navigation, Custom comment template, Basic column grid included, Child theme support and many more. I have collected some hard earned experiences as a quick reference to help you make the most important considerations before choosing your theme. Keep you investment safe. Setting up a new site takes a lot of effort and sometimes it is a costly project to finish. So how do you ensure your new website is easy to maintain and update. First, you have accept that it is not enough to look at the design and features of a WordPress theme. It is essential that the theme you choose is relatively fresh (still maintained), well documented and comes with support. Otherwise, you risk your website investment get in trouble the first time WordPress release a major update or a critical security fix. Look for active support, other user’s comments, check the documentation, and test the theme preview page to see if it seems solid. When it comes to documentation then I personally like video demonstrations of the initial setup and the most important features. Keep it simple! Make sure the design is simple and stripped from all unnecessary design elements. This is a much easier approach for setting up a unique web site compared to finding a crowded and busy theme where you need to start removing stuff. Invest som time in analysing your needs before choosing a simple WordPress theme. This is the hard part, knowing what features you need long term is like reading the stars. One way, however, to get safe through this stage is to look for a theme that have been build for multi-purpose websites. 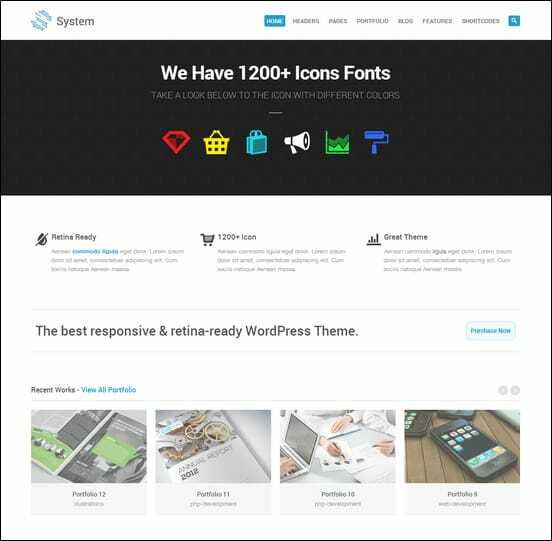 This category of themes get more and more popular and often have a huge collection of layout specific shortcodes, widgets or a powerful page builder. In addtion, multi-purpose themes often have flexible layouts, such as placements of sidebars, multiple header and footer layouts etc. Be clear on what page items you need, such as image slider, animated content slider, news widget, call to action bars, content boxes, build in icons, support for custom fonts etc. Another important feature to look out for is a demo content importer. This is a true time-saver in most projects because you get the demo site setup on your own server. This way you can quickly see how specific parts of the demo website was configured and you can replicate it on your own pages. Very smooth, cheers for these Lars! This is very simple and attractive collection of wordpress blogs. I really like this collection. Lars your tips at the end are great ones to start a website…Thanks buddy. Completely agree Anup that for many purposes they are! You are welcome Bayu, thanks for sharing you feedback! Thanks – found some pretty awesome new ones! You are welcome Flemming, thanks for checking out the article! Nice Collection. Child Theme for Twenty Eleven Paper is best theme for me. Thanks for sharing. First time i see this type of large and good theme collection. I also try some of them. Keep sharing Very interested information. Tripwiremagazine always delivers. This is the first place I come to look for the best wp themes and plugins. Great to hear Caleb ! Thanks for sharing your view on the value of our articles! This was exactly what I was looking for! Thank you for posting this. Now I can narrow my list down considerably for my WordPress site. Great to hear Michael! Hope you find the perfect match. Wow. This is the Best Collection Ive ever seen of such Amazing Themes. SmartStart WP is Just Awesome !! Nice theme and wordpress is best ever….. Thanks for putting this together. The designs are beautiful. The only thing I wish your site would provide is a check list of features that can be used to help filter out designs that don’t contain the features that we must have on our site. Nice collection of minimalist themes. Thanks also for including some free themes! Good to hear that you liked the article Steven, did you find what you were looking for? Thank you for this list. Look forward to using some of the designs in further projects. Well the list is awesome. Thanks a lot for giving me these many options for selecting the theme.. I am glad you found the article useful Guarang! Please share if you found the right one. Which one did you refer to Sehat? Very nice themes. Great curation. Thanks. Nice collection of themes. Just realized some sites I have always thought were using customized high-end premium themes actually use most of these free themes for wordpress sites. Thanks. nice theme! i will use it soon! what a collection, thanks for share. Thanks for the latest themes you done great job. I liked Simpla the most. This is a cool post.. I’ve seen good and useful wordpress theme which we can follow. Thank for posting this simple themes.. Hope to see more of these. Thank you for the list. This is a great compilation of the best and is an inspiration for my site. Simple designs may look good in the presentation, but if you don’t know how to use them, how to fill it with high-quality content and well-picked fonts, it will look like any other ordinary and boring theme. I think it’s best when you make your own and try to customize it in order to fit your content. I use Lubith to make my designs and I always think twice before I start: if the site has great content and fits into a minimal layout, I go for that. If not, the design is mostly what grabs attention. I like most of the themes. I’m just looking for a simple one with 2 colums at frontpage and 1 column for post-view. Between each post at post-view there should be shown: 3 other articles + 1 ad. Pretty cool list! I am actually in the process of redesigning my site and wanted some clean themes. There are a couple that I have seen which could possibly work. Thanks for taking the time to create such an in-depth and well thought out list. Great list of nice simple and clean wordpress themes! very nice clean templates, i love the Silverio template! Great Collection! Would anybody like to give me more examples of minimalistic, very simple themes (if free – great) that can suit a small business, a private homeopath clinic. There is no need of any special technical skills to use these themes and you can easily and quickly post your images, quotes, videos, slide show, text or your photos. There is also an option to remove the original domain name and use a custom domain name. The Tumblr themes could be especially very useful for the internet marketers or the social media marketers as they are very unique and are steadily growing. What a beautiful and inspiring list. Thank you!